Rubenerd: Why rip up functional footpaths? Why rip up functional footpaths? 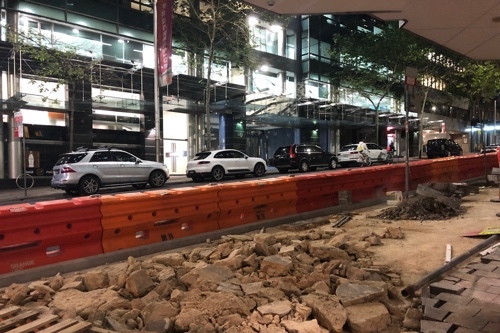 North Sydney workers and residents have been dealing with road works for a while. The stretch of Pacific Highway near the post office and Vodafone buildings had deep excavation pits for what seemed like months. I saw equal parts plumbers and fibre engineers; I guess they were killing two birds with one phone. But the largest works that have been ongoing since Clara and I moved here two years ago have been the footpaths. The irregular, terraced sandstone everywhere in the suburb is slowly being jackhammered and replaced with uniform blocks. Right now they’re working just outside Greenwood Plaza. The photo below shows some of the work. Ignore the plain tiles to the bottom-left, that was part of the building behind. Why are they doing this? The old footpaths were entirely functional, and were already asethetically appealing. The new tiles aren’t any more attractive; if anything their regular shape is boring by comparison. The only reason I can fathom is the irregular pattern rendered it bumpier for wheelchair users. But even then, the council were able to grind the previous surface smooth when they were removing graffiti; and I’ll bet it took less effort than removing and resurfacing everything from scratch.